This paper attempts to shed new light on the effect innovation has on employment. 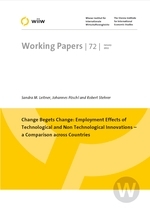 Specifically, it identifies the net employment effects of technological product and process innovations as well as complementary non-technological organizational innovations which have so far mostly been bypassed in comparable analyses. The analysis applies the 4th Community Innovation Survey and determines and compares innovation-induced employment effects in both manufacturing and service sectors across three country-groups: i) a set of Central and Eastern European transition countries, ii) a group of Southern EU member states as well as iii) a pool of Core EU member countries. The results reveal interesting differences across types of innovation, sectors or country-groups analysed. Particularly, in both manufacturing and service sectors of Central and Eastern European transition countries and Southern European countries, employment expands in response to the introduction of product novelties or process innovations only. Non-technological organizational innovations, on the other hand, had a detrimental effect on employment in the manufacturing sector of Central and Eastern European countries only. In contrast, employment in both manufacturing and service sectors of Core European countries only reacts to the introduction of new products but remains unaffected by the implementation of process or organizational innovations.